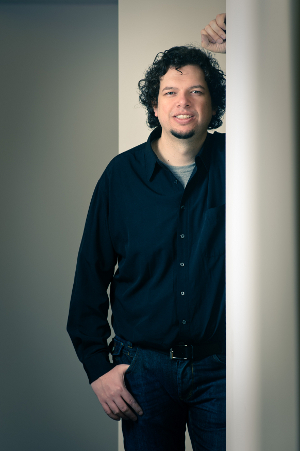 My name is Ivo Jansch, I’m the founder of Egeniq.com, I’m a developer, book author and conference organizer. I’m currently working on the book ‘N ways to be a better developer‘ together with Lorna Mitchell. September 5 2014 will be our first installment. It will be held in Amsterdam, in the wonderful Tuschinski Theatre. I’ve been organizing the Mdevcon conference for a number of years, which focuses on mobile app development. I’ve noticed there’s an interest in a similar conference but focused on the backend side of things. There are so many platforms and tools and so many ways of doing APIs – I think it’s a good idea to listen to experienced API developers and see what works for them and what doesn’t. We want to bring together developers and create an environment where people can share experiences and learn from each other. >> Can we tag this as a PHP API Conf, or a general API conf regrouping any programmers using/coding APIs? That’s a great question, because I think that no matter what language you use to build APIs, we often face the same challenges. Therefore we want to bring together not only PHP developers but also Ruby, Python and other developers. There are some talks specific to a certain language, but most talks should be relevant no matter what language you use. At the Mdevcon conference we have learned that this works great. For once, we’re not fighting among communities or talking about who has the best language, but we’re talking to each other and learning from each others experience. And maybe someone will see a language they’re not familiar with and new worlds might open up. We aim for around 200 developers, but since this is the first conference that people are still discovering, we don’t mind if it starts a bit smaller. The conference is by developers, for developers. We welcome developers of any server side language. And app developers looking to build APIs for their apps. Of course architects and team leads are also welcome! We have Felix de Vliegher who many in the PHP scene know from his conference talks and PHPBenelux usergroup involvement. Felix is one of our speaker liaisons and part of the call for papers committee. Then there’s Thijs Damen, who acts as our ‘chief operations officer’ during the conference, making sure everything runs smoothly and all speakers are happy. Thijs is in the CFP committee too. The final member of our call for papers committee is Harry Walter, who is involved in several Ruby and PHP communities in the UK. We are a ‘self organized team’ so mostly people just pick the things they like to do. I usually end up with the ‘boring’ stuff such as ticket sales and arranging hotels and flights. On the day itself, we get help from the entire Egeniq development team, and everybody just picks the roles they like. For a new conference like Endpoint it’s a bit hard to find sponsors, since we still have to prove ourselves. For our mdevcon conferences we have noticed that the most important thing is to create a great conference. We never worried too much about sponsorships (we don’t have any incentive to turn a profit, as long as we can cover the cost of the conference we’re happy), but still we attracted more and more sponsors. The last mdevcon conference we had some really interesting sponsors, and we hope we can do the same for Endpoint. >> What unique opportunity does organizing an API Conference, presents? There are a number of reasons we organize conferences. One is to get in touch with developers. We love to build a network of developers to share knowledge and to find people we can go to if we need extra developers for a project. Another reason is that it fits our role of wanting to be leaders in the field of technology. We don’t employ any sales managers so it helps if we can convince our customers that we are great to work with by showing our work and explaining that we run conferences on these subjects. But perhaps most importantly, it’s so much fun. I was one of the founders of the Dutch PHP Conference years ago, and it’s always been great fun to organize conferences, talk to people, meet with speakers and put up an event that people like. We run a call for papers so that we can have a great schedule. Conferences that only invite speakers limit themselves to their own network and their own ideas. We like the idea of just presenting the topic we want to cover in the conference, and see what people come up with. We’ve always seen some great ideas come from a call for papers. Also, it gives less experienced speakers a chance of getting to speak at a conference (of course if they are knowledgeable enough). The primary criterion is content. Is the talk relevant and engaging enough. Other factors include someones’ background (what makes them a good speaker on a specific subject, for example their experience with the technology). We appreciate everyone’s effort to try and submit, so once we send out rejection mails we like to thank them for that effort and give them a discount for the conference. We also allow people to ask for feedback on their submission, if they are looking to improve their submissions over time. You may have noticed the Endpoint schedule isn’t yet fully filled, we’re still going over some of the talks and haven’t send out a lot of rejections yet. >> Is this the only API Conf or is there other ones out there? There are several out there, such as API Strategy and API Days. We like to differentiate ourselves from these conferences by having more focus on technology and developers (some conferences focus a lot on tools and management). In Amsterdam, it’s the only API conference targeted at developers that we are aware of. >> How is it different from a PHP Conference? Interestingly, if you compare PHP conferences in 2014 to PHP conferences just 5 years ago, you see less focus on PHP as a language itself, and more focus on frameworks, libraries, architecture etc. Our API conference takes that just a step further. We think the language choice is becoming less relevant, and it’s more about architecture and what you actually build with your language. I think I covered that already in some of the answers, but if I had to pick one thing, it’s our focus on technology without focussing on one specific programming language. That’s a hard one to answer since it’s the first Endpoint, but we’ll see! We’re always open to feedback and always looking to improve. It’s the first Endpoint, but I can draw lessons from other conferences I have organized. One important lesson is: be organized! There are so many things to arrange to put up a conference, it’s important to do everything at the right moment and be prepared for everything. We follow up every conference we organize with a questionnaire. We try to incorporate the best ideas and the best feedback into our next conferences. 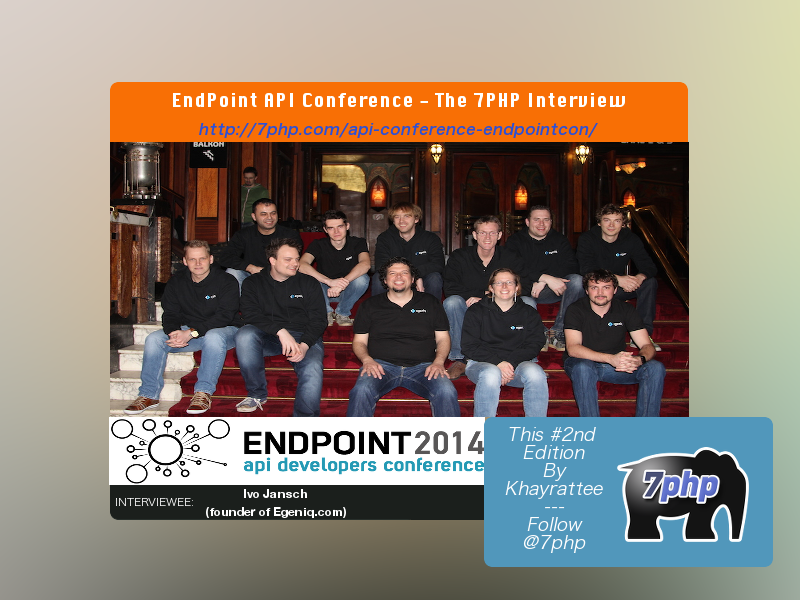 The first Endpoint conference will be on friday September 5 2014. You do a conference only once a year, so it’s less often that you have to arrange things. On the other hand, a conference is much bigger than the average user group meeting, so there’s a lot more stuff to take care of. I hope it can be an inspiration yes. >> This conf is organised by your company, Egeniq. Was this a thought-after step prior to creating this Conf? I mean, was the indirect aim behind to promote your company as well, because as Michelangelo van Dam best says it: “Community works for business too!“. Please give us your whole opinion on this and your advice. Of course! It helps Egeniq as a company if we organize conferences. For example when we have job openings. We don’t generally advertise jobs at our conference because we want companies to safely send their staff to a conference, but if someone is looking for a new job and they got to know us through one of the conferences, that is a big advantage. Also, meeting speakers and being around influential people is very beneficial too of course. And since we are a distributed company (we usually work remotely), it’s also nice to have 2 conferences a year where we are together with the whole team. That’s always a lot of fun. Ivo Jansch & His API Experience..
>> Your advice on buildings API – what have you learned so far and which you can share with us? I often remind people ‘you are not facebook’. If you build an API for internal use, it’s ok to learn from the best, but keep in mind that there are differences between building an API for millions of unknown users, or an api for a specific set of apps that are under your control. Practical applicability of APIs is one of those things we like to focus on during the conference too. But jokes aside, I think it’s best if you start out by consuming other apis. Use an api from someone else and see what you like and don’t like about it. If you’ve worked with APIs it’s much easier to build APIs that others can use. Probably the first time I ever used an API and thought ‘wow, magic, I just called code on someones server’. >> Common mistakes that you think people tend to do while creating APIs? Some people are overzealous when it comes to what an API should look like. I’ve seen teams argue for hours on the naming convention of their endpoints. That’s like the old ‘tabs vs spaces’ debate. Find something that works for you and the consumers of your apis. Sometimes I say ‘Useful over RESTful’. REST is nice and can usually be applied quite cleanly, but if you spend more time arguing how RESTful your api is than spending time on making your API work, you’re doing it wrong. >> Is API the next big thing for the years to or is it already in-it? APIs will be everywhere. Every device will be able to consume APIs, and every service will offer them. I like Slack. Slack is a communication tool for development teams. They basically integrate chat with all the apis of all the tools developers use, bringing together the output of all the tools under one roof. That’s great use of APIs. I think both Symfony2 and Zend Framework have great tools for building APIs. But beware of the fact that an API call often doesn’t need a full application stack like a full html page would. Keep the APIs light. Check for best practices in API development in these frameworks before you start coding. >> A framework that you highly recommend to building APIs on iOS znd Android? On iOS, I love AFNetworking as a library for API consumption. On Android, GSON and Retrofit are great tools for consuming APIs. Every platform has a number of tools for working with APIs. A little investigation into what’s possible before you start will be helpful. In any case, there’s almost no reason to deal with APIs with just the low level tools that a language offers. Use some higher level abstraction layer or library. It will save you time. I hope everyone will have a fun conference and will be back for more next year! Not really, you have been very thorough with your questions. Or maybe, how about we do a little contest (for those of you who have read this far, I know I’ve been rambling on for a while now :). 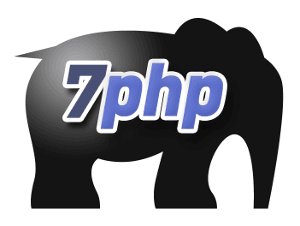 If you tweet about the conference by mentioning both @endpointcon and @7php I’ll raffle a conference ticket among the tweets on August 8. It’s not my quote, but I really like the phrase ‘life is what you make of it‘. Success, results and happiness do not ‘just happen’. You need to plan ahead, work on reaching your goals and never stop learning.